Manifold is a Marvel character that first appeared in the Secret Warriors series. He is mentioned as being held by the Australian government in Season 3 of Agents of SHIELD. Fun Facts: Daisy Johnson describes Manifold as a "Souped-up teleporter"
Eden is an Australian Aborgini Mutant with the power of bending reality or teleportation. The teleportation power he exhibits is more advanced than typical moving between place to place. He is one considered to be one of the powerful teleporters in the Marvel universe as his power can create holes between time and space that remain active until he chooses to close them. 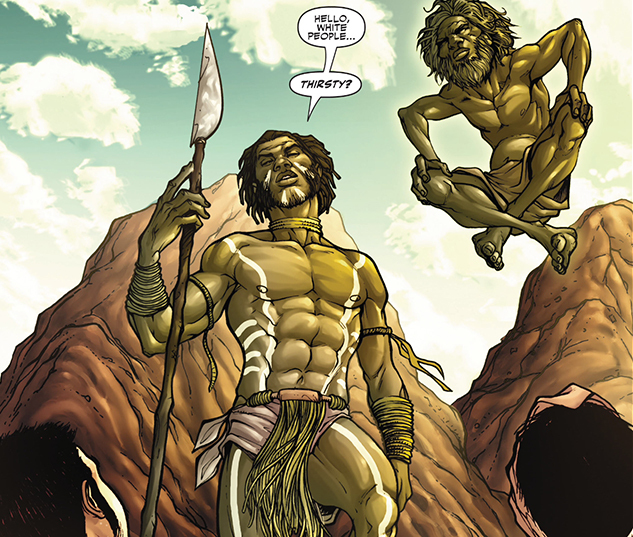 Eden is living in Kata Tjuta Australia under the tutelage of fellow mutant Gateway. Nick Fury has added Eden to his Caterpillar files. The files are a list of potential powered individuals who are unknown to most. When the Skrulls infiltrate Earth, Fury begins to find and recruit the persons on the list and this includes Eden. He is given the code name Manifold and joins the Secret Warriors and later the Avengers. He joins the Secret Warriors in battles against the Skrulls and later against HAMMER and the Dark Avengers. He is left badly wounded and comatose after fellow Secret Warrior Hellfire betrays the team. Before the Secret Wars event Eden is asked by Black Panther to teleport people into Mister Fantastic's life raft designed to survive the destruction of the universe. In the story A Nation Under Our Feet Eden Fesi is again recruited by Black Panther. This time the Panther combines his power of locking on to a target with Fesi's teleportation to create portals to hunt down cells from the terrorist organization known as "The People". The People were implanting Stark like generators into people who then used the power to blow themselves up. Eden is one of the most advanced teleporters in the Marvel universe. He can create portals in space time that he and others can walk through. The portals can be kept open for an indefinite amount of time. He is mentioned as being held by the Australian government in Season 3 of Agents of SHIELD.